Impossibly dense, deep, and powerful, black holes reveal the limits of physics. Nothing can escape one, not even light. Even though black holes excite the imagination like few other concepts in science, the truth is that no astronomer has actually seen one. We’ve “heard” them, so to speak, as scientists have recorded the gravitational waves (literal ripples in spacetime) emanating from black holes that collided with one another billions of years ago. This soon may change. An audacious global project called the Event Horizon Telescope is currently working to piece together an image of a black hole for the first time. And if it does, it will be a remarkable accomplishment. Because as massive black holes are, they’re actually incredibly hard to see up close. Black holes are born when massive stars collapse in on themselves and create a region of gravity so intense that not even light can escape its grasp. Astronomers also speculate that some black holes may have been formed in the early chaotic universe after the Big Bang. The biggest problem with trying to see a black hole is that even the supermassive ones (with masses millions of times heavier than our sun) are relatively tiny. What’s more, because of their strong gravity, black holes tend to be surrounded by other bright matter that makes it hard to see the object itself. 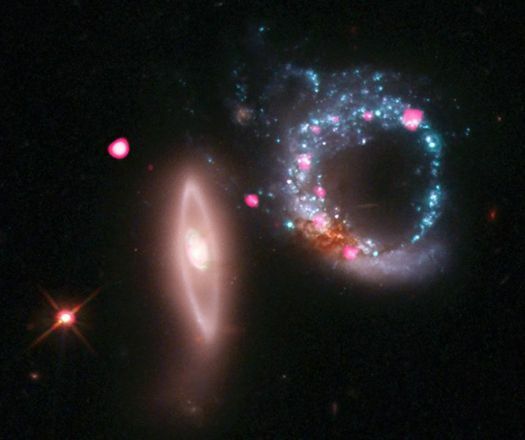 That’s why when hunting for black holes, astronomers don’t usually try for direct observation. Instead, they look for evidence of the effects of a black hole’s gravity and radiation. 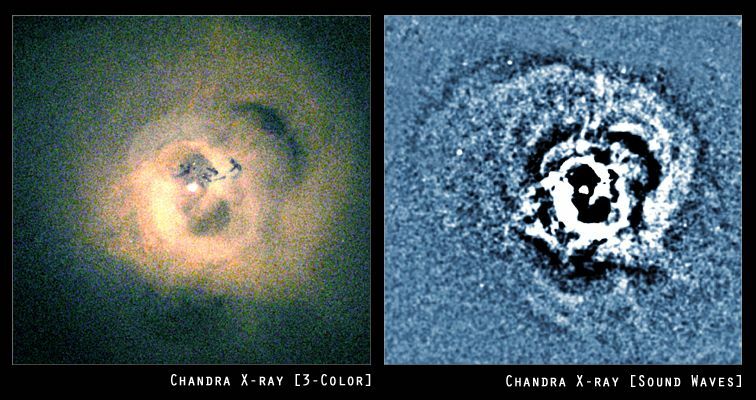 Some of the best indirect images of black holes come from the Chandra X-ray Observatory. 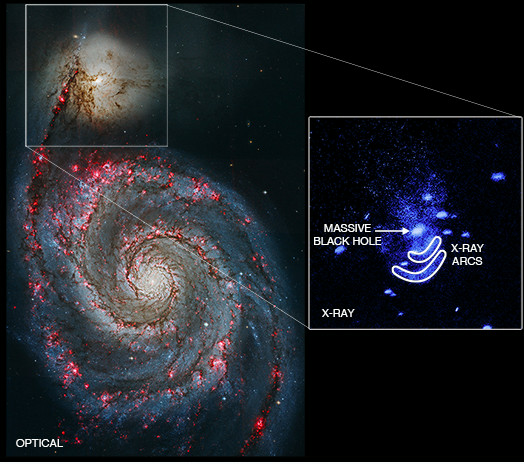 “The friction and the high velocities of material forming out of a black hole naturally produces X-rays,” Peter Edmonds, a NASA astrophysicist and communications specialist working with Chandra, said. And Chandra is a space telescope specially designed to see those X-rays. This composite image (combining data from Hubble and a radio telescope) shows jets of energy and matter being thrown out of the center of the Hercules A galaxy. These jets shoot out at nearly the speed of light, demonstrating the awesome destructive power of black holes. This next image shows massive jets that are thought to be propelling away from the black hole at the center of Centaurus A, a galaxy 13 million light-years away. The jets are longer than the galaxy itself. We can’t see a black hole. But we can observe the effects of a black hole’s extreme gravity on the objects around it. Here’s a very cool illustration of that. You’re looking at 20 years of data on the stars that live near the supermassive black hole at the center of the Milky Way galaxy, called Sagittarius A. And yes, stars — some many times more massive than our sun — are orbiting it. We haven’t directly observed this black hole, but scientists suspect it’s there, because nothing else can explain the orbits of these stars. “These orbits, and a simple application of Kepler’s Laws, provide the best evidence yet for a supermassive black hole, which has a mass of 4 million times the mass of the Sun,” explainsUCLA’s Galactic Center Group, which produced the animation. Here’s another look at the same phenomenon. This video includes 16 years of observations from the European Southern Observatory. This isn’t an animation — it’s real images of stars sped up by a factor of 32 million. Watch them dance around a mysterious blank center. We can’t see a black hole yet. But we can “hear” them collide. When two black holes collide, they unleash a massive wave of gravitation. Just as sound waves disturb the air to make noise, gravitational waves disturb the fabric of spacetime to push and pull matter as if it existed in a funhouse mirror. If a large gravitational wave passed through you, you’d see one of your arms grow longer than the other. If you were wearing a watch on each wrist, you’d see them tick out of sync. When two black holes collide, they unleash a massive wave of gravitation. But by the time they reach Earth 1.4 billion years later, those waves have become very faint (like how the ripples from a stone dropped in a pond mellow out the further you get from the stone). Because the black hole in the center of our galaxy, Sagittarius A, is so relatively small, and surrounded by so much occluding material, it’s going to take a huge telescope to see it. According to Nature, it would take a telescope 1,000 times more powerful than Hubble to get enough resolution to see it. An international effort called the Event Horizon Telescope is an attempt to solve this problem. Conventional optical telescopes use bigger and bigger mirrors to see objects smaller and farther away in the universe. The Event Horizon Telescope is doing something similar: It’s creating a virtual telescope the size of the entire Earth. In April 2017, the Event Horizon team connected radio telescopes at multiple locations across the world — as far-flung as Hawaii and the South Pole — and instructing them all to look toward Sagittarius A for a few days. The network is the result of an international collaboration of 14 research institutions across the world. Together, these eight telescopes have the power to “count the stitches on a baseball from 8,000 miles away,” as MIT explains. The array generated such a huge amount of data that it was more efficient to fly the data from each of the telescopes to a centralized location than it would be to transfer it over the internet. Right now, the scientists are in the midst of stitching all that data together. They’re hoping the final image will show the event horizon, the boundary beyond which no light can escape. That event horizon will likely be surrounded by an accretion disc, a bright, incredibly energetic ring of matter that swirls around the black hole. It could look something like this.